Lush Levuka, Fiji’s former capitol is also one of Fiji’s few check-in point options. We were impressed at the highly visible red-orange navigational markers posted on the church clock-tower roof and in the hillside behind it. Now a sleepy little backwater, whose clapboard storefronts look more like an old Western movie set*, it takes a bit to imagine that nearly 200 years ago in 1822s, Levuka was established as Fiji’s bustling capital city. Back then, sandalwood trade, whaling, copra and just general piracy made for a wild, avaricious and raucous town. As each industry died away, and Fiji ceded to Britian, Suva became the less geographically challenged primary port of commerce and in 1882 usurped Levuka’s capital status. We wanted to sneak a peek at a piece of Fiji’s past, and to replenish a few groceries, so we stopped at Levuka. 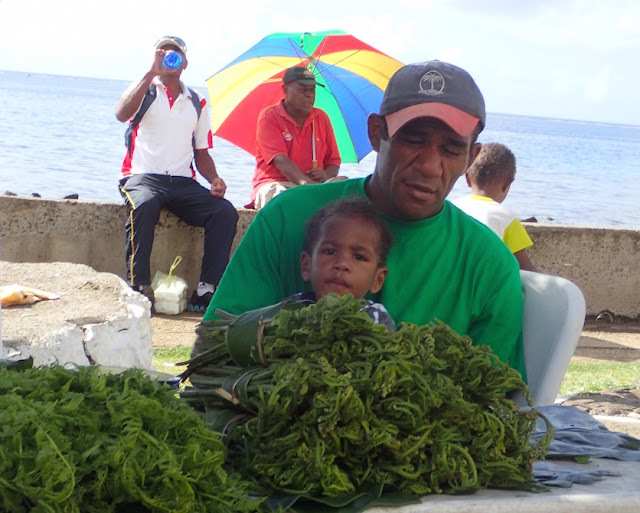 This very soft-spoken Levuka Fijian farmer gently explained how to prepare the ferny yet supposedly spinach-like oka greens he sold. His young son appeared far less enamored with my ghostly complexion. 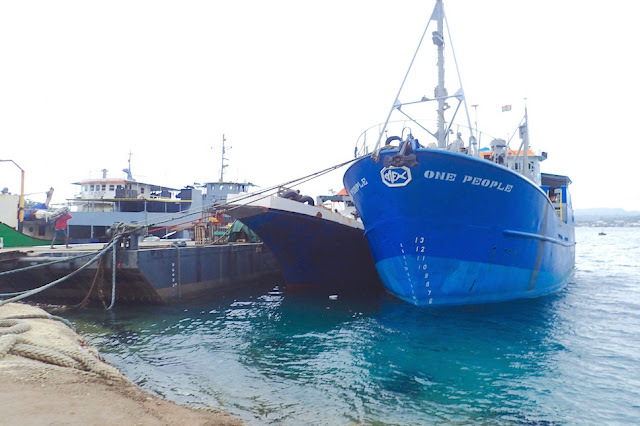 As we dropped anchor late on a Saturday morning, Farmer’s Market was in full swing, the typical day for it in Fiji and Tonga. There were only a half dozen or so stands, selling mostly the same stuff… taro roots and leaves, pumpkin, and oka, a ferny-looking spinach-like green. I wanted to try the oka, but opted out on that blistering hot afternoon. 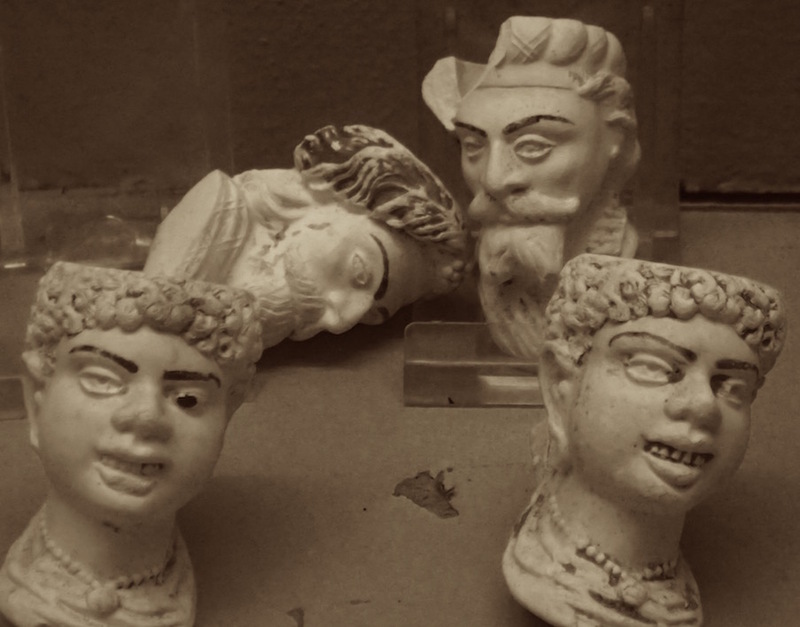 The creepiness of these quirky antique pipe figurines in Levuka museum’s display were oddly alluring. We enjoyed a little respite from the heat in the un-air-conditioned museum, which offered a smattering of town history, a good-sized shell collection, a pleasant mish-mash of other bits and pieces. Good for about 15 minutes. Stopping in site of the original M&H supermarket (there’s a substantially larger one in Suva across from the Central Market, which is quite nice) our hopes of better produce options were dashed. What was there was heavily depleted, not that fresh and a bit pricey. We left with some carrots, cukes and bell peppers, bypassing the battered tomatoes and soft, sprouting spuds. Most of the remaining stock was heavily processed package goods and non-food items. This was only slightly less true in another Levuka supermarket I checked out. 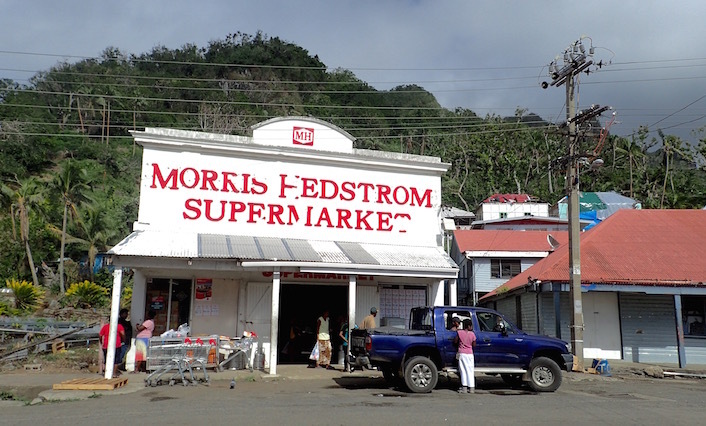 Levuka, where Fiji's primary grocery store chain, MH began. The one in Suva is much nicer. We passed the guidebook recommended Whale’s Tale restaurant, which was hopping but didn’t register on my nose-knows-must-stop-for-a-bite infallible restaurant irresistibility meter*. Nor did we stop at the recommended watering hole aka Grand Hotel, as with shut entry doors, we assumed its welcome mat was not out. That, despite being hot, hungry and thirsty. Worse, Levuka’s Saturday throngs, converging under the town’s covered store porch sidewalks left me feeling a bit claustrophobic. *If a whiff of the wafting scent of an eating establishment makes my mouth water, it’s a definite go, not, no go. Still undecided about whether to linger at Levuka overnight or leave*, we watched a few minutes of a couple overlapping rugby matches. Those guys – and gals – play hard for a full-contact game without protective padding or helmets! *Our options upon leaving were pushing on to Makogai (18 miles away) or even straight through to Savusavu (66 miles away). the tuna factory was a bit pungent, but paled in comparison to PagoPago’s (American Samoa). The final deciding factor was whether or not the Digicel wifi was viable at anchor. We were able to get a signal, but at a molasses-like “speed.” We could’ve subscribed to the Grand Hotel wifi, but my gut was telling me to get out, ASAP. We did, just catching the edge of a rainstorm on the way to Makogai. 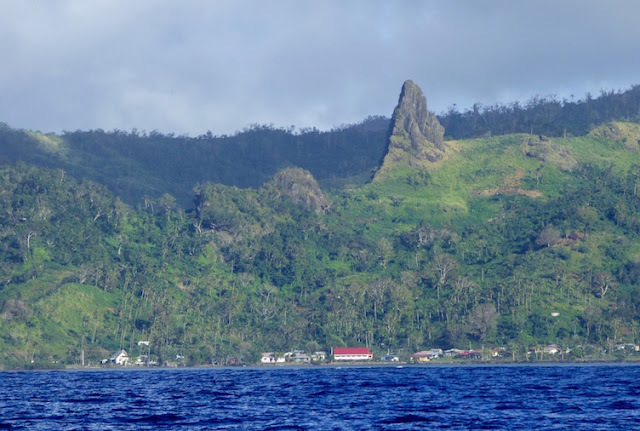 As we distanced ourselves from Ovalau, Levuka appeared to be a bit of a convergence zone, its peaks a cloud vacuum which needed to periodically divest themselves of their moisture. With a sigh of relief, we dropped anchor in Makogai’s sunset-bathed glow in a calm bay. We satisfied our curiosity about Fiji’s former capitol, picked up a few sundries and moved on. Levuka’s worth a few hours if you want a brief passage break, but not that compelling for a longer linger in my books. Approaching Levuka at dawn from the Kadavu isles, the lone spire at the edge of town reminded us of Ua Po, French Marquesa’s spires. 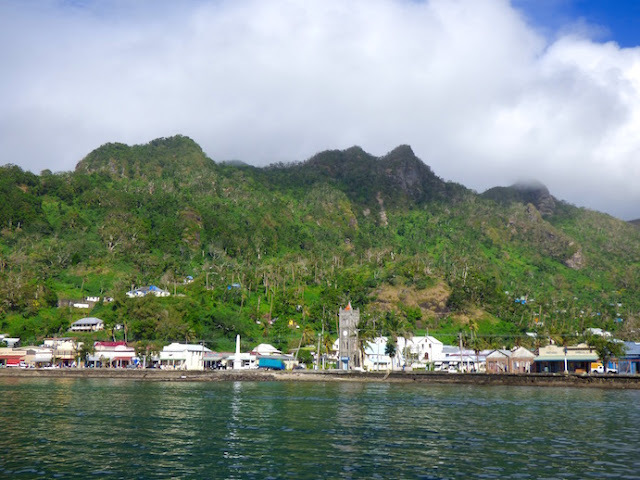 June 18, 2016 we arrived and left Levuka, Ovalau isles, Fiji S17.40.897 E178.50.168). 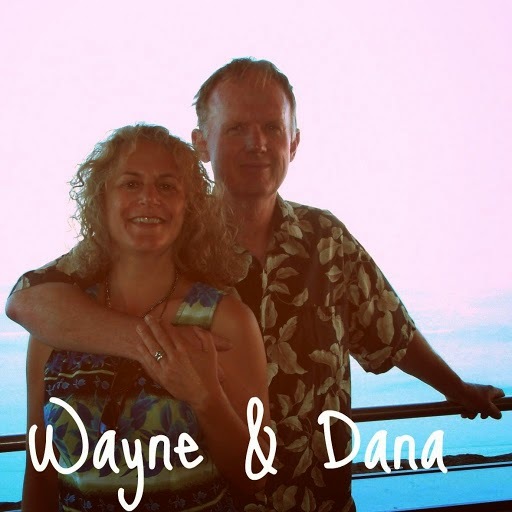 We are currently in Savusavu, Vanua Levu, Fiji (S16.46.706 E179.19.785).